We have so many questions about how princesses lived in the Medieval era. How could they stand wearing those gorgeous gowns without taking even one selfie? How did they keep those billowing sleeves from dragging through their morning porridge? How often did they actually interact with unicorns, once a week, monthly, biannually? Life as a royal may not have been the perfect life that we've come to imagine from fairy tales but those regal girls certainly knew how to dress. 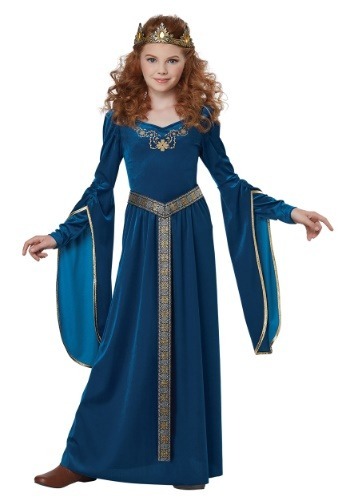 If you see your daughter snap to attention when anyone mentions castles, she will love this luxurious teal gown. Straight out of Avalon, this graceful ensemble would blend into the King Arthur tales perfectly. Once in this gown, she's going to want her first unicorn ride but it'll be up to you to let her know that those mystical horses haven't been spotted since the 1200s. Sure, she might be disappointed but she'll forget all about it once she sees the photos you've been snapping of her. Regal details pepper this velvety gown from head to toe. The metallic edging of the full, hanging sleeves is echoed in the floral design along the neckline and the brocade ribbon belt. Any courtiers that saw a princess in a gown this gorgeous would want her crowned, pronto. Whether your family is attending a Renaissance festival or your girl wants to dress up as Camelot's first lady, Guinevere, for Halloween she's bound to feel that rush of nobility when she feels the lush fabric of her sleeves. Turns out, it's easy to have to best of both worlds. She can dress like a princess but she doesn't have to give up modern conveniences like electricity and plumbing. Now that she's learned that you're just going to have to get used to called her "my liege".